Also, DON'T FORGET: Our 12 Days of Christmas kicks off tomorrow, so be sure to come back to the blog and see what we have in store for you! 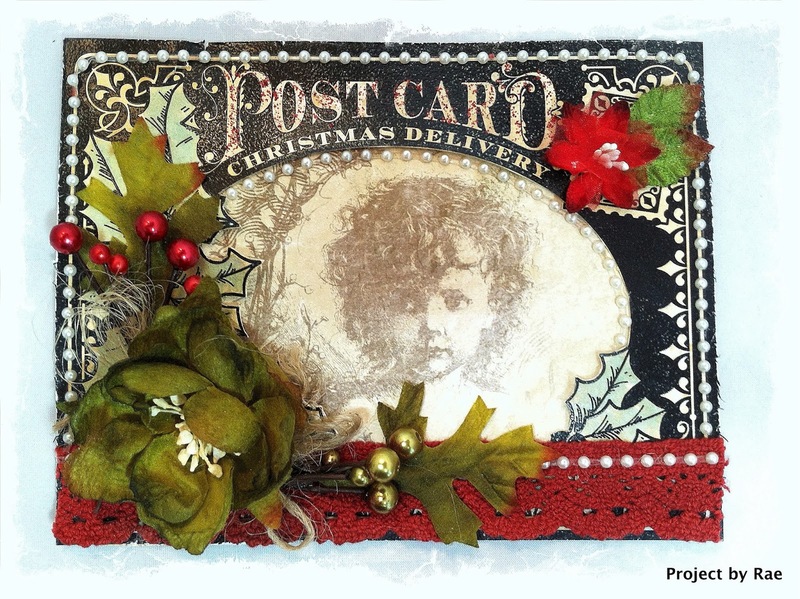 For twelve days, starting December 1st, one of our designers will post a Christmas project. It could be a tag, a card, a gift box, etc.! The designer will then give an "assignment" based on her project, and you will have until midnight EST to complete the assignment and post it to the contest gallery. There will be a winner EVERY DAY!!!!! That's 12 prizes to be won!!!! 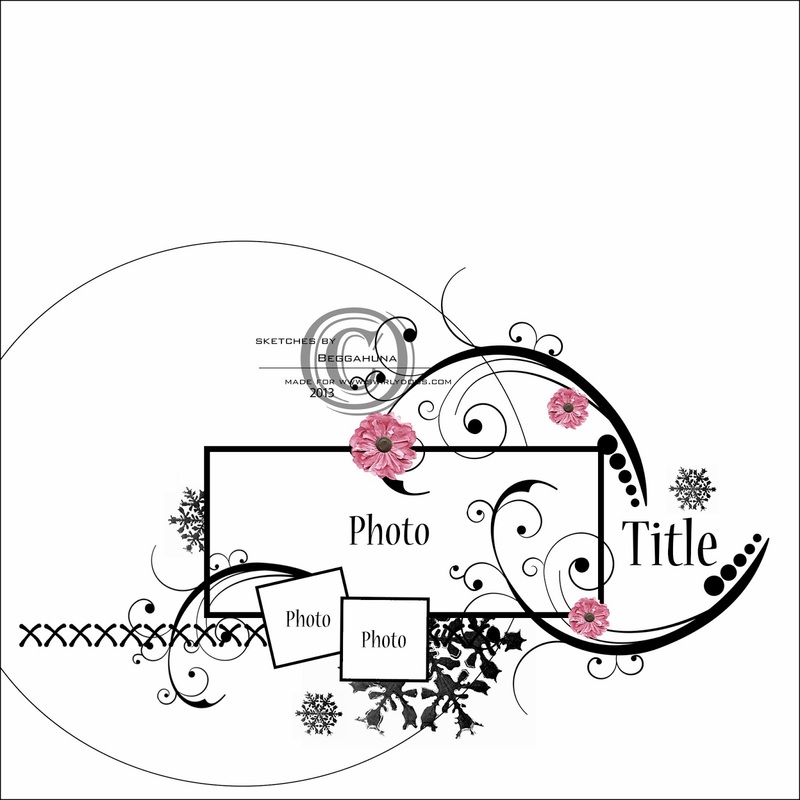 We know that sometimes scrapbooking can take a backseat for the holidays, but hopefully you see this as an opportunity to add a personal touch to your gifts this year. We hope you will join us!!!!! 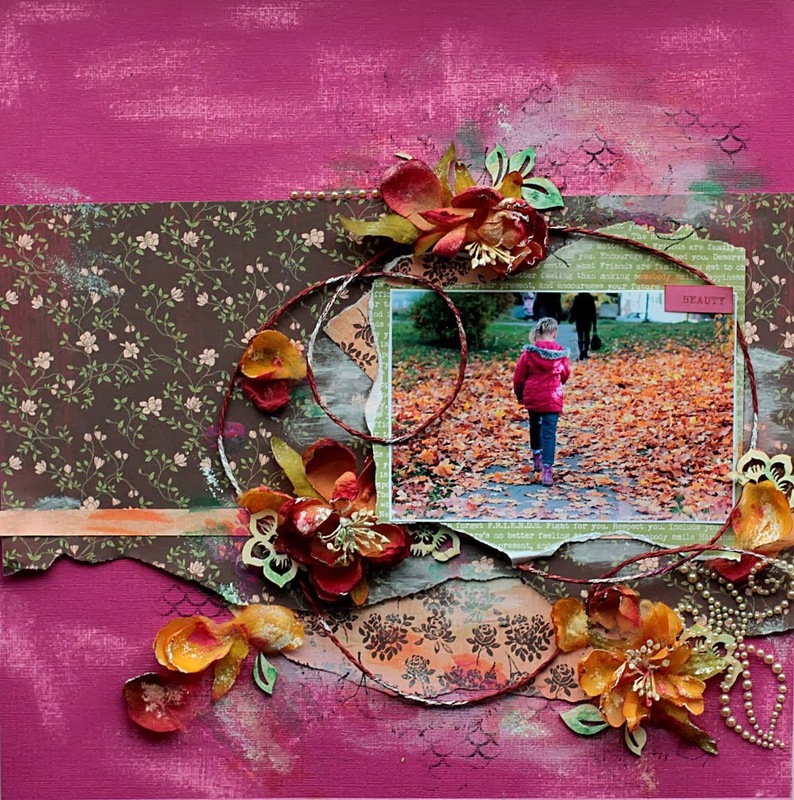 using the November "Autumn Rose" kit. This tag has an "open up" function and a pocket inside. I'd like to share my last project with the Swirlydoos November kit, Autumn Rose. This kit was so lovely with all the lush colors and romantic feel. 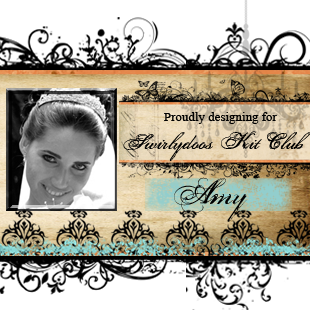 I love to collect vintage images and wanted to use this one wit the kit, romantic and vintage! I heavily distressed two layers of pattern paper for that worn aged look. Then misted and stamped randomly. Once that was all dry I added some molding paste using a Prima mask. From there I just started adding embellishments. I've designed the butterflies and you kind find them HERE. My layout was based of the November sketch over at Once Upon a Sketch. Hello everyone. Elena here today and I have some cards to share with you. You know, I am more a Layout girl, but Christmas is coming, and I can admit that almost everyone is busy with making some handmade cards for their friends and relatives. 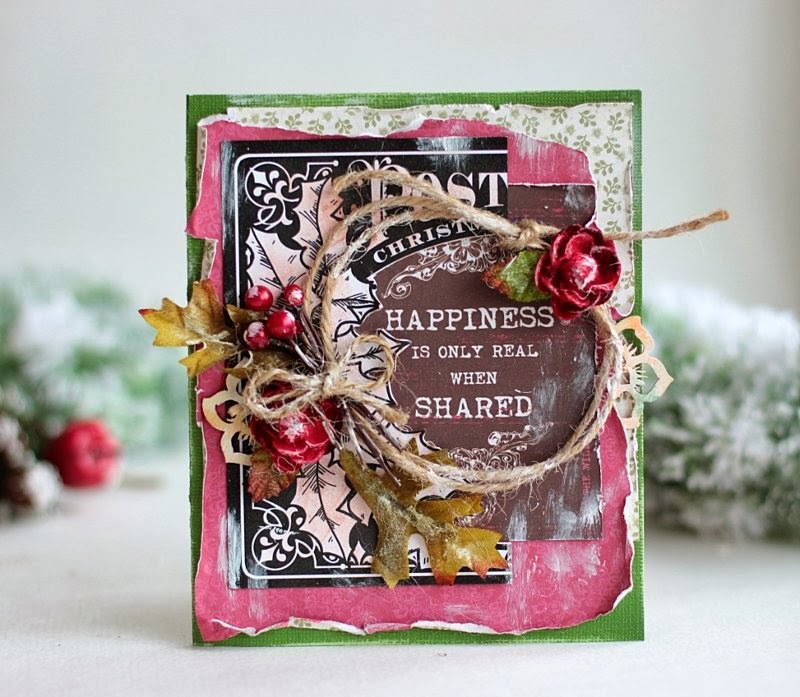 Moreover Krissy prepared a great add on - Christmas Card Kit this months and it is packed with everything you need to get started creating Holiday Cards. I have prepared a video tutorial for you. 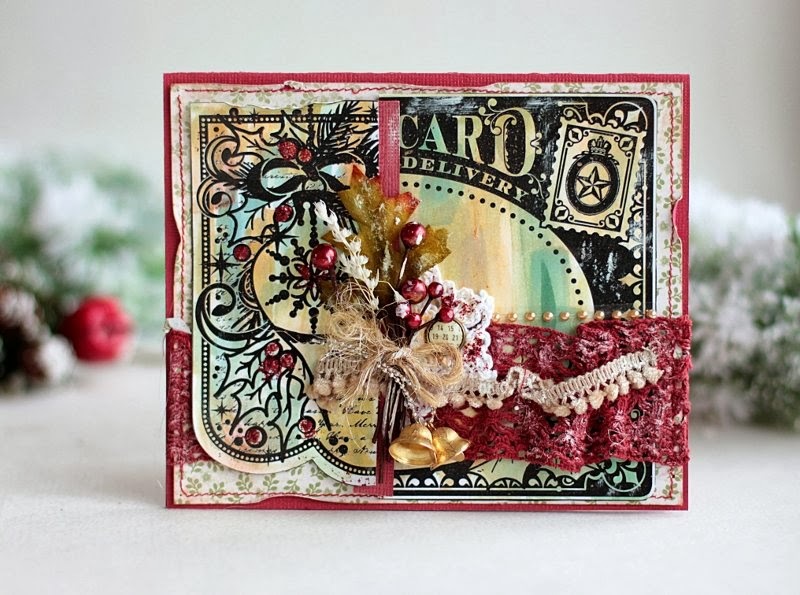 Just add any of the Holly embellishments you have ( even from the previous kits), and you have some pretty cards. 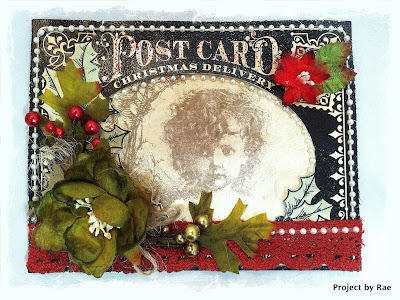 And the last card, it is not Christmas, it is more Autumnal, as I really liked the papers went in the main Kit. 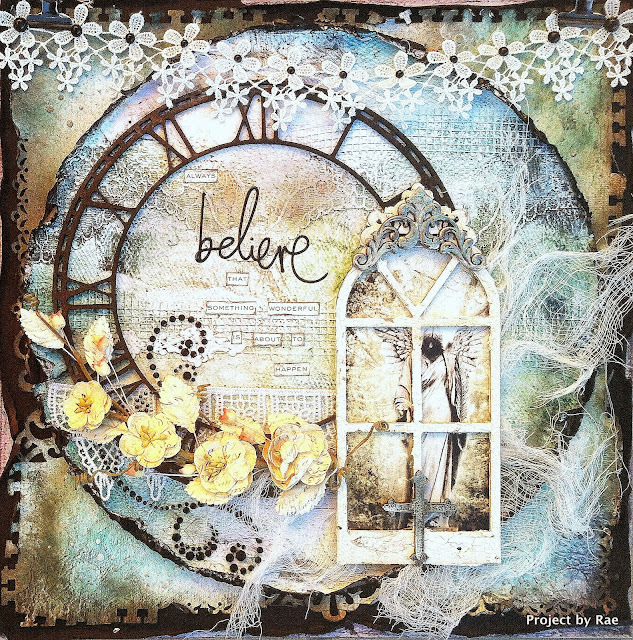 I just made a mixed media background and distressed the layers. as I will come back nest month too. Hi Everyone! Amarilys here sharing with you some of my Autumn Rose November Kit projects! 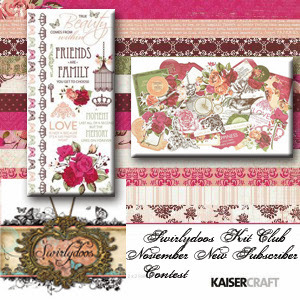 This kit is simply amazing and full of gorgeous Kaisercraft Lady Rose papers and matching embellies! 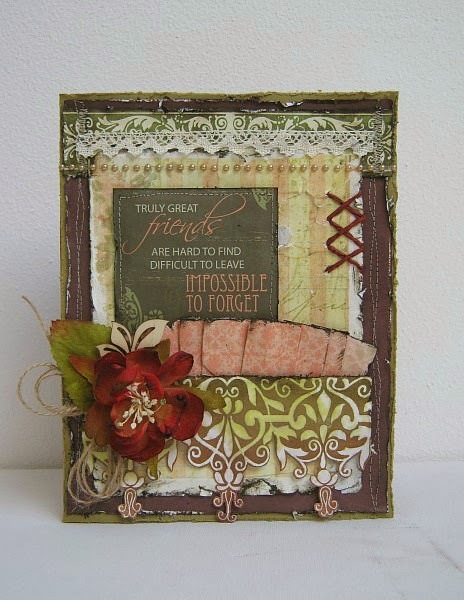 For this one, I used the die cut Kaisercraft paper included in the kit and added it over a distressed light green paper. This kit was begging to be used in a little girl's page so I 'borrowed' a few pictures of my friend's adorable baby girl when she was 6 months old! 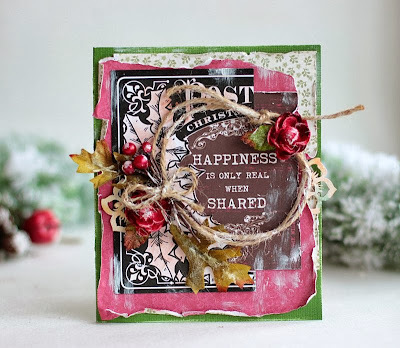 The outer layers (red and light beige) on this layout are actually the leftovers of a die cut paper that I cut and used in another page this month. Instead of tossing these two layers, I distressed them and added them over another pattern paper and I instantly had another layered 'die cut' background paper to work with! For this layout, I used a picture of my hubby and I back in 2008 when we made our own masks for a masquerade party. I made some roses with the cardstock included in the kit and the Spellbinders Rose Creations dies. I also used some Heartfelt Creations dies for the leaves. Of course, by the time I was done making layouts, I ended up with a bunch of smaller size leftover pieces of pattern papers and embellies. Instead of putting those away, I turned them into cards! 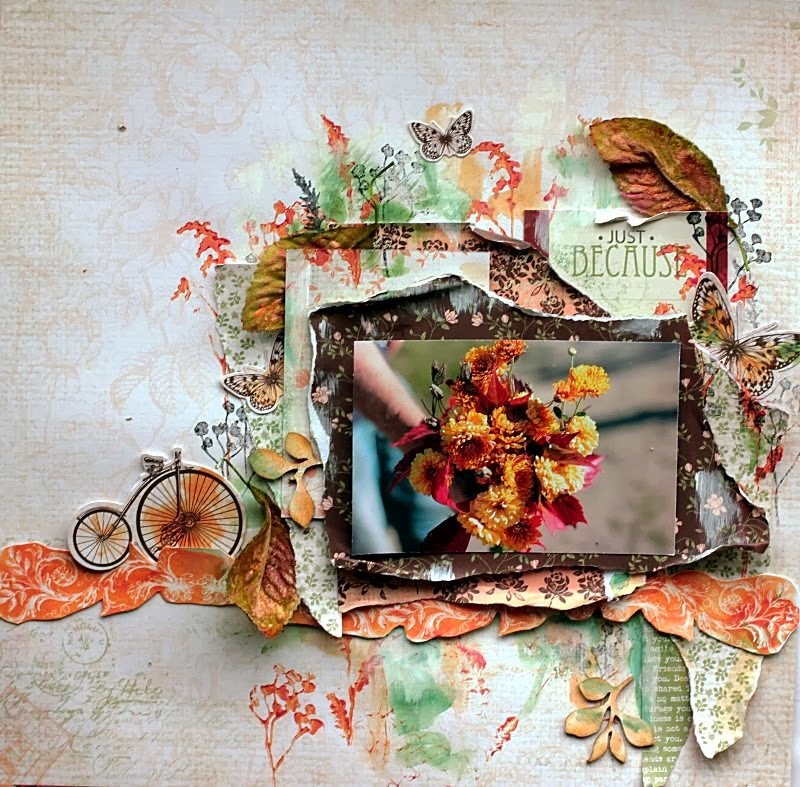 This kit also included a Prima wooden box with a bunch of little wooden leaves and flowers which I used throughout my pages this month. I thought the box was just too cute to throw away so I made a mini shadow box with it! I used tiny (1.5"x1.5") pictures from a mini photo-shoot that my hubby and I did ourselves when we found out last week we were expecting a little boy next April! The word boy is actually just added to the photo in Photoshop and I used Glossy Accents to make it stand out a bit more. This is the first altered project I've made for our unborn baby boy and will go in his nursery once we finish it! Sweetest Thing Sketch Challenge Winner! Thank you to everyone who participated in our October monthly sketch challenge! We had many lovely entries, and voting was very difficult for the DT, but we managed to choose this fabulous layout by Misha! Congrats, Misha! You'll be getting a prize sent out with your December kit! 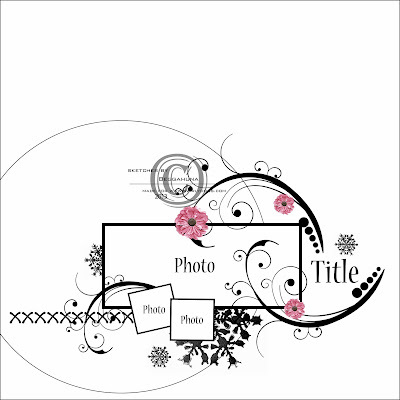 Layout of the Week - Misha!! I was knocked off my chair. The colors are simply delicious, and that center cluster - creative perfection. Her attention to details within the layers is stunning, and the different angles, well, I am just in love. Misha, congratulations!! Thank you so much for sharing in our gallery!! 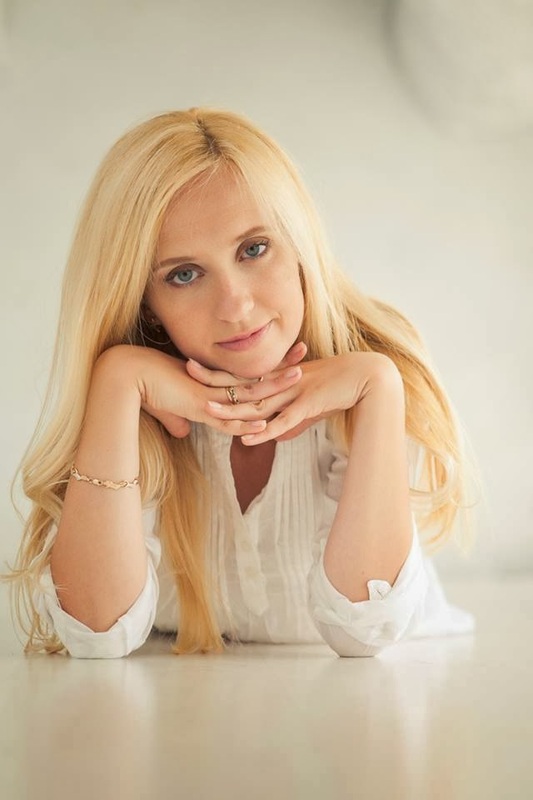 We are so pleased to have Elena Olinevich guest designing with us! "The Silks and Maigicals are quite versatile and can be used not only for their direct purpose - coloring, but I used silks for my stamping and distressing, silks for creating come watercolor effects and adding some glimmer for chipboard pieces. Also I colored Heidi Swapp Invisibles - Borders with Silks using my fingers, and on the video I am showing the difference between when you apply it with the brush and with your finger." I created a step by step photo tutorial, to let you peek into the creative process. I don't think of yellow as a color that I want to use that often on my layouts, and when I do, it's usually just for accents. 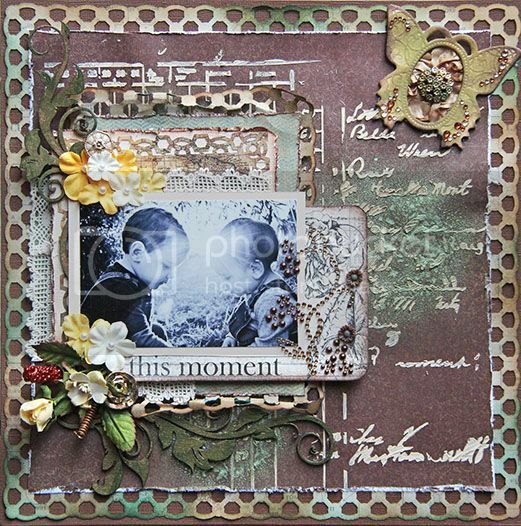 I just adore the way Jodie used yellow on this layout. The clustering is fabulous, and the layers are PERFECT! Such classically beautiful layout! Congrats on getting LOTW, Jodie!!!! I hope you are all having a lovely Saturday! This week, I asked for some suggestions for video topics from our subscribers, and one of them was showing what you could do with the mediums that come in our latest kit add-on: the mediums add on. So, today, I will share with you some way you can use the mediums we got in the add-on with the Autumn Rose collection. 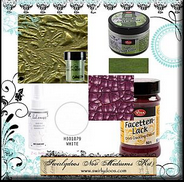 So, I spent the evening playing around with the Heidi Swapp Color Shine in white, the Viva Croco Paint, and the Lindy's embossing powder. Viva Paper Soft also came in the kit, but I already made a video based on that medium, which you can find HERE. Hopefully, this will be useful for getting started using these mediums! Enjoy the rest of your Saturday!!! THANK YOU to everyone who participated in our Autumn Rose blog hop- thank you for all of your wonderful comments! Please send your mailing info to rae@swirlydoos.com within seven days to claim your prize! Be sure to join us for our December blog hop on 12/5!!!!! 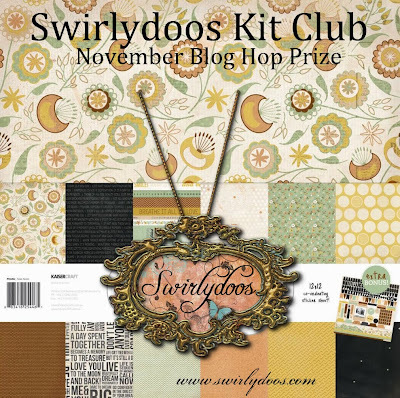 November Kit Reveal & Bloghop! 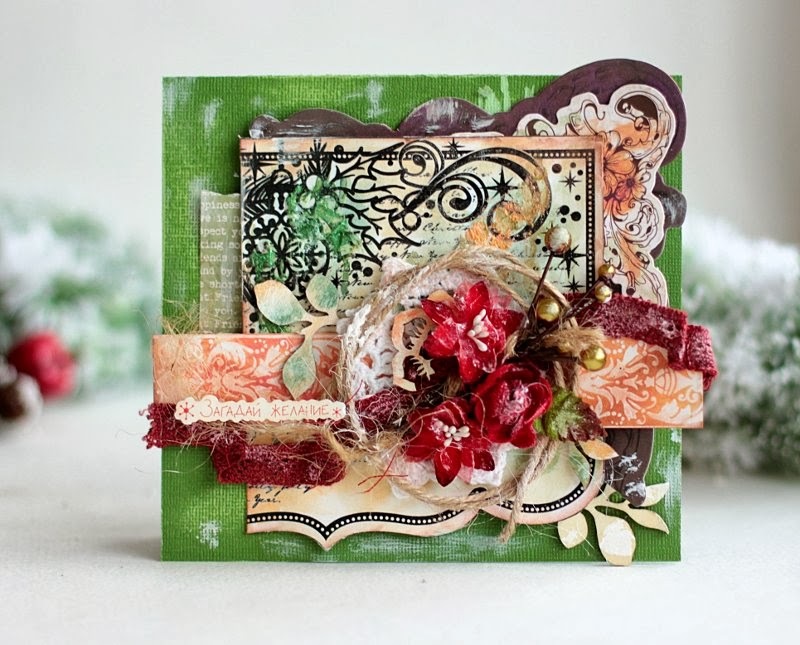 Our Education Team is going to show you how to make fabulous card toppers from Hot off the Press into beautiful Christmas Cards! Be sure to go to our home page for a link to a video tutorial using the Christmas Card add on! 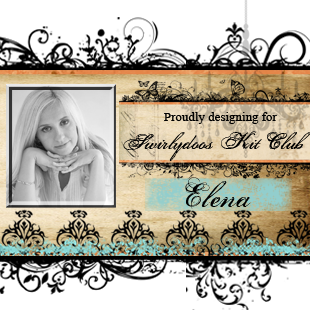 We are excited to share with you that Elena Olinevich is guest designing with the November kit, and we will share her amazing projects later this month! 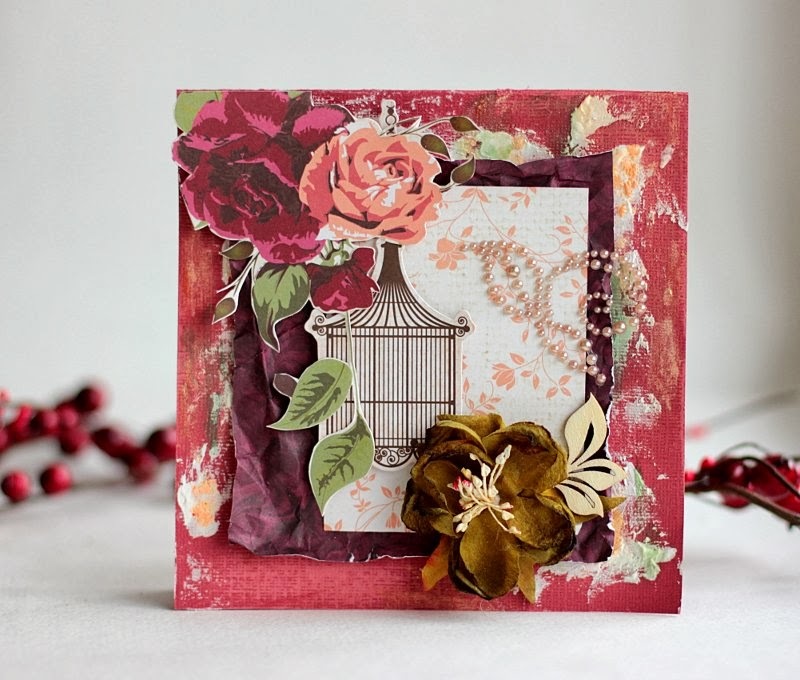 November Sketch, created by Beggahuna specifically for the Autumn Rose Collection! 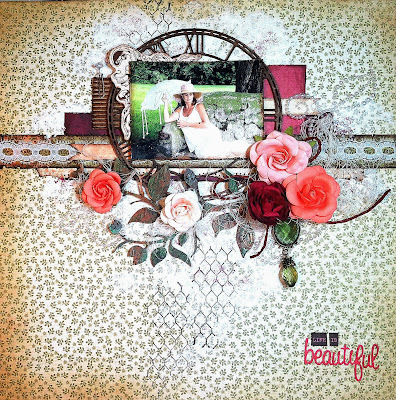 This beautiful sketch is your inspiration, now get creating! 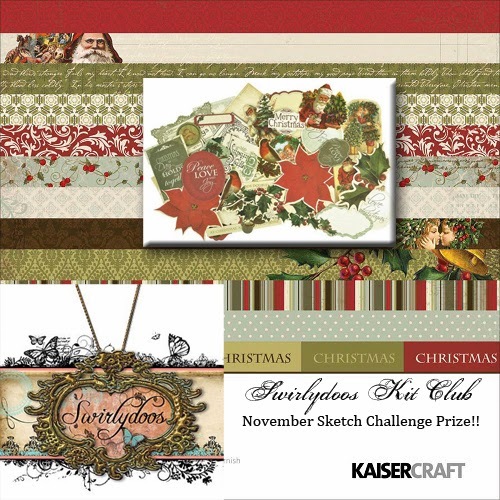 Our November sketch challenge runs until December 15th, and is open to EVERYONE! Upload your layout into the "Autumn Rose" section of the Swirlydoos Gallery and you will be entered to win the fantastic prize pack pictured below from Swirlydoos! Check the sketch challenge thread in our forums to see what the designers and other members have created using this sketch for inspiration! 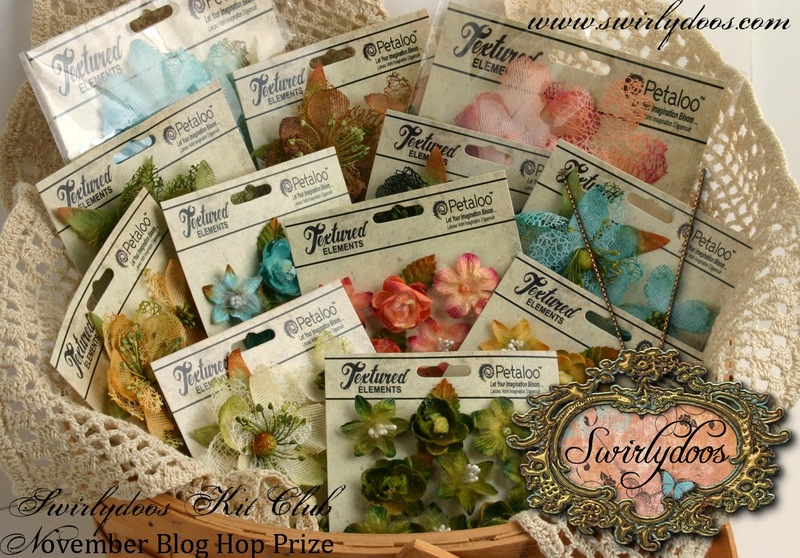 And, now for the prizes to be won during this blog hop!!!!! The party starts at Angelica's blog. Have fun! 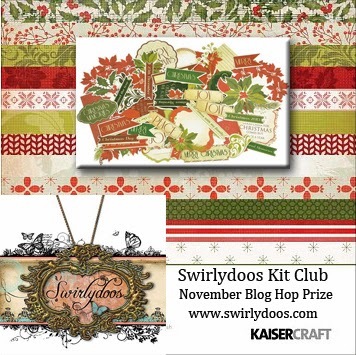 Subscribe to Swirlydoos Kit Club between November 1st - 30th and be entered to win this awesome Kaisercraft Prize pack! Layout of the Week 11/03/13 PALA! When I spotted this beauty by Pala in the gallery this week, I couldn't keep my eyes off of it. 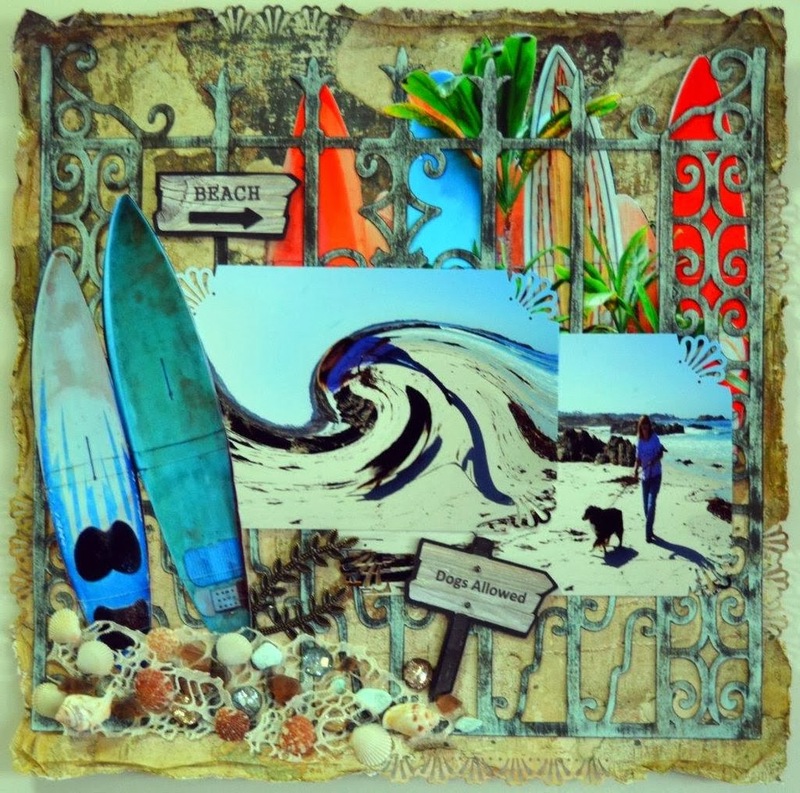 I LOVE her use of color in "The Beach" and her perfect placement of embellishments give such great movement to the project. Gorgeous...!! Makes me want to step into some sand right now! Congratulations, Pala! 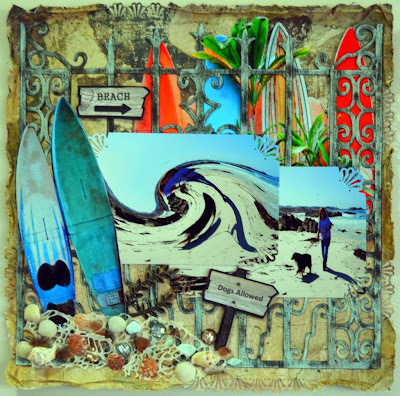 Thank you so much for posting in the Swirlydoos gallery! 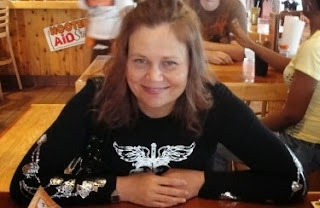 I am Maria Harms, married to my husband Luke for almost 24 years (Holy Batman - I was only 17 when I met him!). We have two children - a son who is 22 and a 14 year old daughter. I am currently employed full time as a paralegal for a personal injury attorney and live in sunny Florida where I am already complaining about the cold mornings, at a bitter 68 degrees. Unfortunately, I have a Lupus and it seriously messes with my ability to craft as much as I would like. I would love to participate in more round robins and challenges, but find that my current treatment, which involves being in the hospital for 9 days every 3 months is just down right time consuming and inconvenient. I started scrapbooking in January of 2009, after my DH watched an infomercial on the Cricut and decided I would like it and bought me one. I loved it and ended up with a regular one, a mini, and the last one that did print and cut. Sold them all and bought a Silhoutte Cameo which is even better. 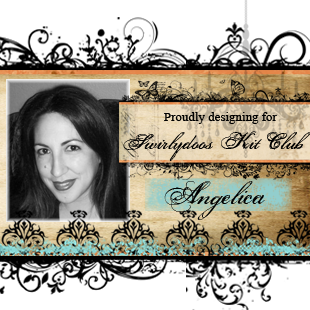 I joined Swirlydoos in August of 2011 after a short stint at another kit club that didn't live up to my expectations. I don't thinking have really settled on a style yet, but out of necessity, due to energy and the fact that I am just slow, I think cards and tags is my future. I will put everything and the kitchen sink on my projects and will take a girly frilly project over having to do something masculine anyday. Here are a some of my favorite projects of Maria's, sure to inspire you!! And, the Layout of the Month honor for October goes to Erica Ortiz!!!!! "The photo, which is totally adorable, is surrounded by so many gorgeous layers. Some are distressed, some are punched, lace is being tucked in. And look at that beautiful stenciling and misting! 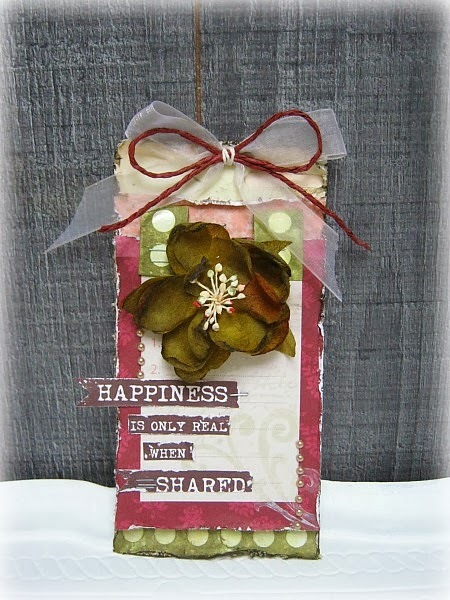 The flower clusters are perfectly placed and the treatment of the chipboard pieces is just beautiful. I also love the inking, of the punched layer that frames this beautiful page."